Dr. Daniel Waldman has treated thousands of patients using laser for toenail fungus. He also teaches other doctors around the world for this treatment. 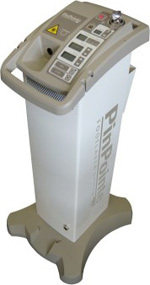 The New York College of Podiatric Medicine has received a donation from PathoLase, Inc., of the company's patented new PinPointe FootLaser for the treatment of onychomycosis, and will be teaching the College's students to use the new technology in conjunction with a clinical research study to be conducted at the College's clinical affiliate, Foot Clinics of New York. able to offer patients at our clinical affiliate, Foot Clinics of New York, this alternative, non-invasive approach for patients suffering from toenail fungus.” Foot Clinics of New York expects that it will be able to start offering treatment with the PinPointe FootLaser beginning in late June. How does the laser work? This patented laser is specially designed to shine through your toenail and destroy the specific pathogens embedded in and under your nail causing the infection. The laser operates in the very tight spectrum of near infra red light. Unlike CO2 lasers of the past, this laser safely destroys the fungi, molds and bacteria that often cause onychomycosis. Who qualifies for treatment? There are no age or health restrictions or limitations. Is this laser painful? The gentle laser light beam has no effect on healthy tissue. There is no discomfort associated with the treatment during or after. This treatment does not harm or affect your activity in any way. Is this treatment safe? In clinical studies there have been no adverse reactions, injuries, disabilities or known side effects. As you may know, the use of the medication available today for treatment of fungus toenails, carries with it possible systemic involvement (commonly the liver and kidney). This laser does not! Does my insurance pay for this? Because this treatment is considered aesthetic, health insurance plans do not cover this treatment. We accept major credit cards and personal checks or you may use your Flexible Spending Account from work. Does it really work? The clinical studies done this year reveal that over 88% of the treated nails show significant improvement. In most cases fungus nails are completely cured. How soon will I see improvement? On average, a toenail will replace itself every 6-9 months. Healthy new nail growth will be visible within the first 3 months.